A newly obtained document and related emails released on Thursday show that while the residents of Flint, Michigan were slowly being poisoned by lead-contaminated water last year, the offices of state officials in the city were “quietly” outfitted with water coolers by Gov. 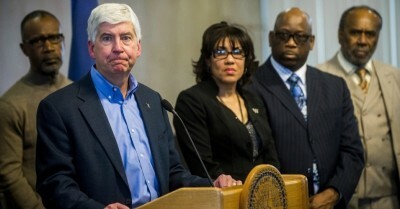 Rick Snyder’s administration. Lonnie Scott, executive director of Progress Michigan, said the emails and document offer new evidence of the Snyder administration’s indifference towards the people of Flint. “It appears the state wasn’t as slow as we first thought in responding the Flint Water Crisis,” said Scott in a statement. In addition to adding to the enormous available evidence revealing the Snyder’s administration lackluster (if not criminal) response to the water crisis in Flint, Scott said the documents also make it plain just “ineffective” and “unequal” the state’s handling of the situation has been.